Geylang is better known as Singapore's red-light district. But the neighbourhood also draws devotees of various religions to the numerous places of worship dotting the area. The Khadijah Mosque at 583 Geylang Road, one of the oldest mosques in Singapore, can draw an 800-strong congregation, made up of locals and foreign workers, each week. Ustaz Dr Mohamed Ali, a member of the Khadijah Mosque management board, says: "It's an interesting neighbourhood. We have many Chinese clans and temples in the area and they are good neighbours." Aside from its location, the mosque is also known for its unique origins a century ago. That the mosque was built in the South Indian style is very rare. And that a woman's will was carried out at that time was even more of a rare occurrence. In 1915, Indian trader and philanthropist Khatijah Mohamed drew up a will with instructions to use $54,521 to buy land and build a mosque and two shophouses as part of her wakaf, or endowment to the Muslim community. She died a year later and two of her relatives carried out her will. Little is known about her personal life. In 1920, the mosque and two shophouses next door were built on a 1,735 sq m plot. They are used today as an office for the mosque and a restaurant. 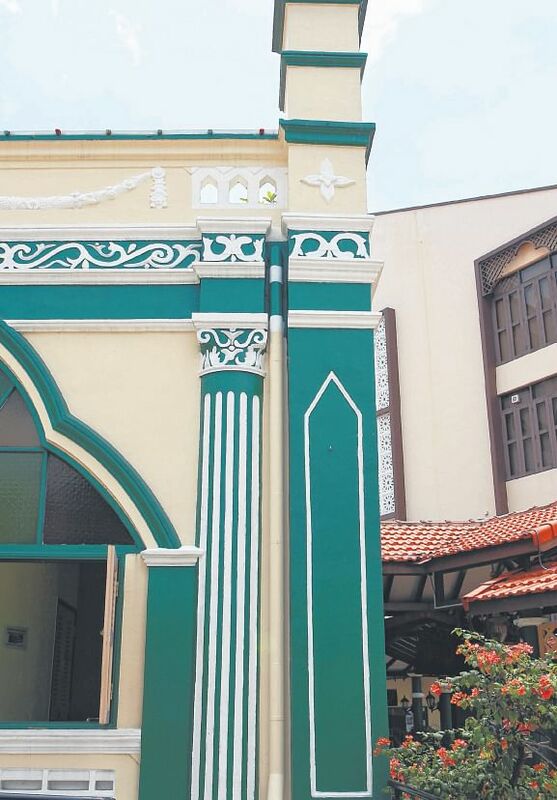 Mr Kelvin Ang, director of conservation management at the Urban Redevelopment Authority, says: "That the mosque was built in the South Indian style is very rare. And that a woman's will was carried out at that time was even more of a rare occurrence." The mosque was gazetted for conservation in 1991 as part of the Geylang conservation area. Over the years, the soft, marine clay foundation started affecting the building structure, which made the mosque unstable and tilt a little, says Dr Mohamed, who is also an assistant professor at the S. Rajaratnam School of International Studies at Nanyang Technological University. There were also cracks in the floor and walls and the timber roof structure was eaten away by termites. 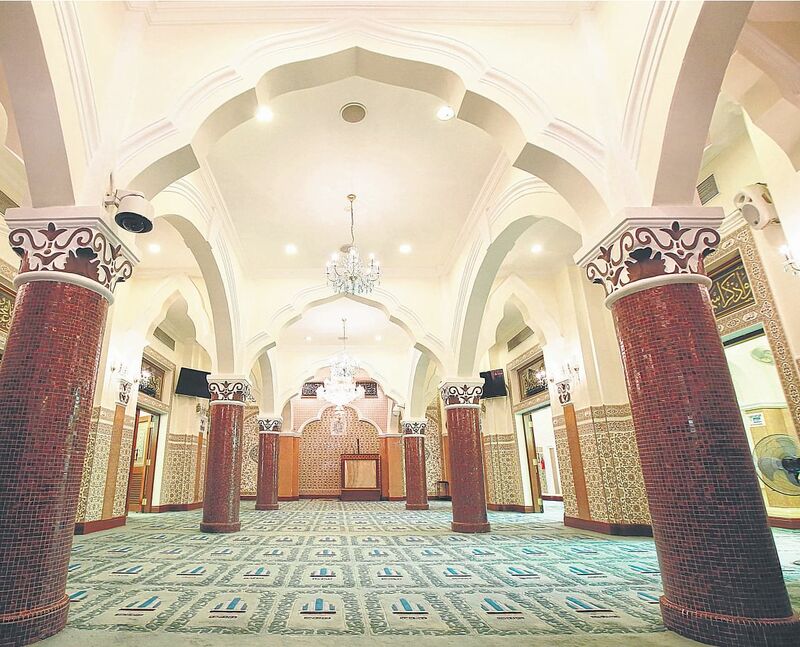 So the mosque raised $9 million to preserve the structure and update its amenities, such as installing air-conditioning. An attic in the prayer hall was also built for female worshippers, as was an annex with offices, computers, a library and a multi- purpose hall. This was completed in 2003. Aside from welcoming worshippers, the mosque grew in prominence for housing the gallery of the Religious Rehabilitation Group, which was formed in 2003. The space, which was completed last year, has training and workshop facilities. It also has counselling rooms for those who have been influenced by extremist terrorist ideology and their family members. •This series is part of a monthly column on heritage buildings. Unlike more contemporary, modern mosques which adapt features from Middle Eastern mosques, the Khadijah Mosque did not have a minaret or a dome when it was built. Instead, the design was said to be influenced by the Nagore Shrine in Ajmer, the fifth largest city in Rajasthan, India. This was where Madam Khatijah Mohamed's relatives, who oversaw the mosque's construction, were from. It was only until the new two- storey complex was built in 2003 that a minaret, a tower from which Muslims are called to prayer five times each day, was incorporated into the design. It was modelled after the Prophet's Mosque in Medina in Saudi Arabia and topped off with the Arabic word for Allah - instead of a crescent moon like many other mosques here. The low boundary wall has concave curves that might be modelled after waves. Such a design was common at the time it was built. Other Indian features include the mound-like stupas (pictured), which were popular during the 19th century, surrounding the pitched roof at intervals. There are also elements of European design. For example, the plaster cornices, which have flutes and floral swags, point to Singapore's colonial heritage. The pitched roof points to the builders adapting styles to the tropical weather, where the pointed shape helps rainwater run off better. Unlike other mosques which are usually column-free, Khadijah Mosque has a few brick columns. There are also two different styles of arches. Facing the pulpit, worshippers are greeted with rows of Indian- styled, corbeled arch design joining columns across the prayer hall. Running the length of the hall, the columns are connected via rounded arches - possibly the influence of the Palladian style, popularised by Singapore's first architect, Irishman George Coleman. 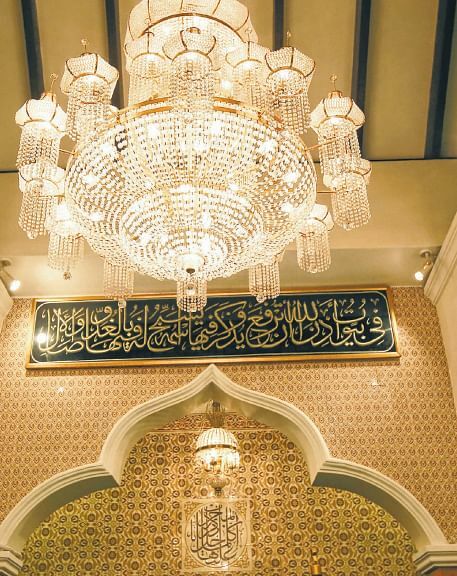 As testament to the area's multiculturalism, the giant chandelier in the main prayer hall was donated by a Chinese passer-by in 2002 when the mosque was being remodelled.